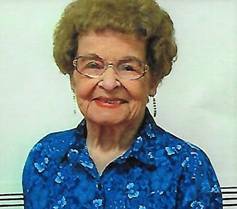 Alice A. Quist, 96, of Greenbush, MN, died Monday, July 2, 2018 in LifeCare Greenbush Manor. Alice Quist was born Alice A. Stasiuk, the daughter of Stefan & Elizabeth (Studnyk) Stasiuk, at Caliento, Manitoba, Canada. She grew up and attended school in that area. She lived several places in Canada and the U.S. before she married Meryl “Bobby” Quist on July 19, 1970 in Florida. They moved to Greenbush where she operated Alice’s Variety Store on Main Street. They also raised and raced thoroughbred horses and they sold farm tractors for several years. Bobby Quist died on October 20, 1983. After his death, Alice worked at the Badger Liquor Store for eleven years before she retired. Alice enjoyed gardening, playing cards, dancing, cooking and picking blueberries. She is survived by: 2 daughters—Elizabeth Claridge of West Vancouver, British Columbia, Canada and Gail Nielsen of Nanaimo, British Columbia, Canada. Son—Leonard Kaychuk of Hollywood, Florida. Grandchildren—Beth & Jason, both of West Vancouver, BC, Lorna and Daniel Nielsen of Nanaimo, British Columbia. Great-grandchildren—Bruce Jones of West Vancouver, BC, Madison, Samantha and Kaitlyn Thompson of Nanaimo, British Columbia. Great-great-granddaughter: Josie May Thompson of Nanaimo, British Columbia. Brother—Marco Stasiuk of Bienfait, Saskatchewan, Canada. She was preceded in death by her husband, a daughter—Violet Beck and sisters—Nellie Dykin, Kay Prokopiw, and Annie Christianson, Tilley Stasiuk and brother—John Stasuik. Step-sisters—Mary & Effie and step-brother—Nick. A Memorial Service was held on Wednesday evening, July 11 at 7 PM in United Free Lutheran Church in Greenbush, with Pastor Alvin Sather, officiating. “Joyful Noise” musical group provided the music. Interment was in Pauli Lutheran Cemetery, rural Greenbush. Arrangements were with Gieseke Funeral Chapel of Greenbush.